On Friday, January 25, the Mother of God visited the Spanish city of Malaga on Costa del Sol (the Sun Coast). It was a very sunny, warm day. 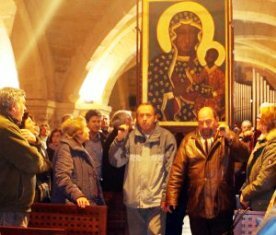 A group of pro-lifers went with the Icon along the main streets of the town. During the official welcoming ceremony at 6.30 PM two traditions, Polish and Andalusian got beautifully joined. At the main entrance to the Church of St. James a cloud of flower petals was dropped like rain on the Black Madonna. In cooperation with the Polish organisation for the Poles living abroad (Wspólnota Polska - The Polish Community) in Malaga a Polish flag that was 5 metres long was raised. At 8.00 PM the celebration of the Holy Mass began. It was presided over by the pastor of the parish and the diocesan pastor of families assisted by a big group of priests. In his homily the pastor explained the idea of the peregrination of the Częstochowa Icon "From Ocean to Ocean" across the world in defence of life. He asked the congregation for ardent prayers in this intention. After the Holy Eucharist the Most Blessed Sacrament was exposed. The adoration lasted throughout the night. On the following day, Saturday, January 26, at 9.00AM the Holy Mass was celebrated. In the homily the priest stressed a big role of testimony in every moment of our lives. After the Eucharist the Matins was said followed by the Holy Rosary in the intention of life and family. People could pay homage to the Icon untill 12.30 PM. The people of Malaga also prepared a splendid farewell for the Mother of God. It was a great experience when the rain of flower petals fell on Her again. She was surrounded by crowds of the faithful. Many passers-by also stopped to see the Mother of God as the Church of St. James is located in the busy centre of the town. At 1.00 PM the Icon left for Cadiz.